In this excerpt from ‘Sweden: the reluctant nation’, published as part of Counterpoint’s ‘Europe’s Reluctant Radicals’ project, Göran Rosenberg explores the history of the Swedish political ideal of ‘folkhemmet’ [the people’s home]. The rhetoric of nostalgia has always been a potent force in Swedish politics. In the best-selling crime novels by the Swedish writer Henning Mankell, the hero is a seasoned, disillusioned and somewhat depressive police superintendent, Kurt Wallander. The crimes that Wallander is set to investigate are all heinous and macabre in character: heads are cut off and scalped, victims have sharpened wooden poles driven through their bodies, others are crucified, or dismembered, women and children are molested, burnt and tortured. These horrible events all take place against the backdrop of an idyllic Swedish landscape, inhabited by trusting and innocent people, unable to imagine such crimes, and even less to plan and execute them. In contrast, the perpetrators are all aligned with sinister and alien forces that invade the Swedish paradise and undermine it. The increasingly depressed Kurt Wallander is given many reasons and ample opportunities to mourn the good society which he once knew and which is now falling apart before his eyes. When the last skull has been splintered, the last child molested or burnt, the last foreign plot exposed, and Wallander warily has demolished the last lie, what has been conveyed is the image of Sweden losing its bearings and mores and becoming a society like all others. The personal depression of Kurt Wallander becomes inseparable from his mourning of the Swedish welfare utopia. Folkhemmet: a tight-knit national community striving for a class-transcending social order based on peace, justice, progress and democracy. According to this rhetoric, the radical reforms initiated and implemented have not been about dismantling the model, but about restoring and maintaining it under changing economic and social conditions. The political debate has largely been about who is preserving the model and who is dismantling it, largely concealing the fact that many of the crucial changes in the welfare system have been implemented in broad consensus. This growing chasm between political rhetoric and actual policy has provoked a sometimes fierce ideological battle within the Social Democratic Party (‘The War of the Roses’) between ‘right-wingers’ and ‘traditionalists’. The former have called for an overhaul of the welfare state, introducing market competition for ‘clients’ and ‘customers’, allowing for corporate providers with profit incentives. The ‘renewers’, as they call themselves, have also encouraged private health insurance as a supplement to the public health system. They argue that Sweden must use market forces to transform public welfare into a competitive and efficient ‘industry’ with global ambitions. Most importantly perhaps, the ‘renewers’ constitute the pro-European faction of the party. In 1995 they advocated EU membership, and in 2003 they campaigned for the euro. The ‘renewers’ overwhelmingly dominate the party leadership and are so far in control of the official Social Democratic agenda. The ‘traditionalists’ are mainly to be found among the core activists of the party. They have largely opposed the agenda of the ‘renewers’, characterising it as a submission to neo-liberal ideologies and the abandonment of fundamental Social Democratic principles and goals. The ‘traditionalists’ want to restrict the impact of market forces on the welfare state, stop the privatisation of public goods, use state power to reverse the trend towards inequality and segregation, and defend the independence of the Swedish social model against global pressures and directives from Brussels. Consequently the ‘traditionalists’ only reluctantly, and only after strong opposition, formally submitted to the official party line in the referendum on EU membership, and were actually allowed to openly confront the party line in the referendum on the euro. In both cases it became evident that the ‘traditionalists’ remained an influential force within the Social Democratic Party, and that the party in fact consisted of two factions, held together by a strong tradition of party discipline and the imperatives of political influence and power. This unofficial and unresolved ideological conflict within the Social Democratic Party has, among other things, manifested itself in a persistent ambiguity towards the European project: yes to the perks of economic integration of membership, no to political integration and any impingements on national sovereignty. This deliberately inconsistent position has not only served to appease the strong anti-European sentiments of the ‘traditionalists’ within the party, but has also appealed to a broader segment of the population. Anti-Europeanism is a persistent and widespread undercurrent in small-town and rural Sweden, where the perks of EU membership and globalisation are not so obvious, and where the weakening of the welfare state is sometimes perceived as an existential threat (perhaps rightly so). This then, is the climate of political nostalgia, a widespread sentiment that Sweden can and must remain a nation apart, fully sovereign to retain, reshape and restore its welfare system at will. This is a climate in which Europe and the EU will always represent a threat rather than a promise, and in which the populist rhetoric of welfare nationalism (defending the welfare system from foreign intrusions of all kinds) might have a potential appeal on both the far right and the far left of the political spectrum. This climate is also sustained and nourished by the long Swedish tradition of neutrality, having created a sense of national independence with little or no footing in a world of mounting global interdependence. The fact that this apparent rift within Swedish society, between renewers and traditionalists, pro-Europeans and anti-Europeans, globalisers and welfare nationalists, has largely been contained within the Social Democratic Party also means that the rhetoric of nostalgia has so far been a part of mainstream politics. 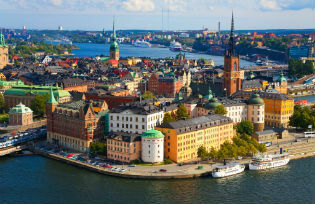 Two parties represented in the Swedish Riksdagen, the leftist Vänsterpartiet and the nationalist Sverigedemokraterna (Sweden Democrats), have platforms demanding that Sweden leave the EU. Both parties have promised, albeit from different positions and with different means, to restore folkhemmet to its former glory: the former by resisting the forces of globalisation, the latter by resisting immigration and multiculturalism. However, neither the Left Party nor the Sweden Democrats have yet been able to attract a larger political constituency: 5.6% and 5.7% respectively in the last elections (2010). As long as the promise of folkhemmet is seen as a legitimate and credible posture within mainstream politics, the politics of nostalgia will resist becoming the domain of political radicalism. As Sweden remains a reluctant nation, the Swedes still remain a reluctant people. Göran Rosenberg, winner of the 2012 August Prize, is a writer and journalist for major Swedish newspapers and magazines. He has worked as a reporter and foreign correspondent for Swedish radio and television and is also a producer of documentaries. This article was published as part of the ‘Reluctant Radicals’ editorial partnership between openDemocracy and Counterpoint.